Founded in 1903, the Linn County Medical Society promotes professional growth for physicians, and quality health care for the community. The LCMS is an independent forum for physician discussion. We provide leadership, education, and representation for physicians as they deliver health care to the community. We exist to serve our members by facilitating physician collegiality, developing solutions to problems, and enhancing the public trust in physicians. The 2018-2019 provider directory is an extremely useful resource for LCMS members. 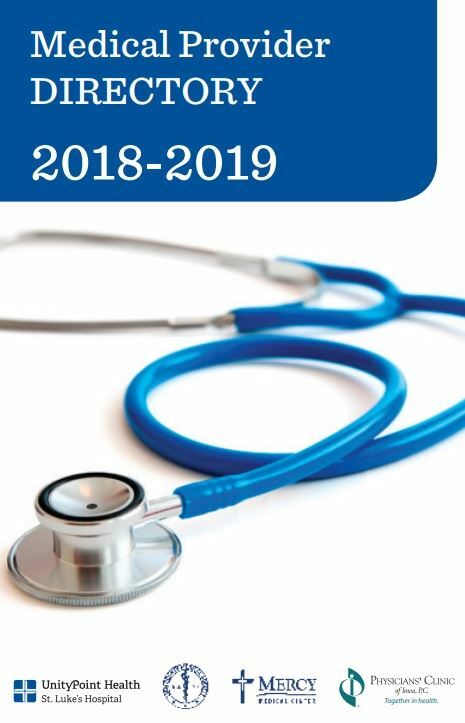 Each year the Linn County Medical Society in partnership with St. Luke's, Mercy, and PCI, compiles this resource and provide it to our members. Members can view the directory online here. You must login to view the directory. Please contact LCMS for any updates or revision that need to be made. Offices may request additional copies of the directory for $15 a copy. Connection: Social events and networking with your colleagues in medicine make for a more enjoyable and fulfilling career. Most social events are free for members. Our password-protected member directory provides contact information for our members. What information you choose to share is up to you. Networking: LCMS events provide a rare opportunity to network with primary care providers and specialists from multiple healthcare systems and private clinics in Linn County. Meetings: Meetings provide quality education and networking for physicians in Linn County. Most meetings are free for members. CME may be offered for certain meetings. LCMS Provider Directory: A longstanding value-add of the society, this provider directory is a comprehensive listing of all providers in Linn County by specialty. To view the 2018-2019 directory, click here. You must login to view the directory. The Blueprint proposes a broad number of changes to prescription drug programs in several federal health care programs (Medicare, Medicaid, and other safety net programs) as well as Food and Drug Administration (FDA) policies that should impact commercial and federal health care program access to affordable prescription drugs. While some of these proposals can be undertaken through immediate regulatory or sub-regulatory actions, others are still on the drawing boards at U.S. Department of Health & Human Services and some will require congressional action to implement. Although the Blueprint proposes a select number of programmatic and design changes, there are a large number of questions for which the Administration is seeking feedback. Based on a preliminary review, it appears that overall there will be increased access to lower-cost alternative generics. However, careful consideration by the American Medical Association (AMA) and Federation members will be needed to a number of proposed changes to the Medicare Part D prescription Drug Benefit program as well as the Part B drug reimbursement methodology as these may limit patient access to medically necessary alternative brand or specialty treatments and result in additional administrative burdens on physicians and patients. For example, it has been proposed to eliminate the requirement that Part D plans must include a minimum of two drugs proven to be effective in each therapeutic category or pharmacologic class, if available. The AMA will be preparing comments to the various proposals, but does applaud overall efforts to increase competition through a number of FDA proposals as well as proposed bans on gag clauses and ensuring a substantial portion of rebates are received by Medicare beneficiaries at the point-of-sale.